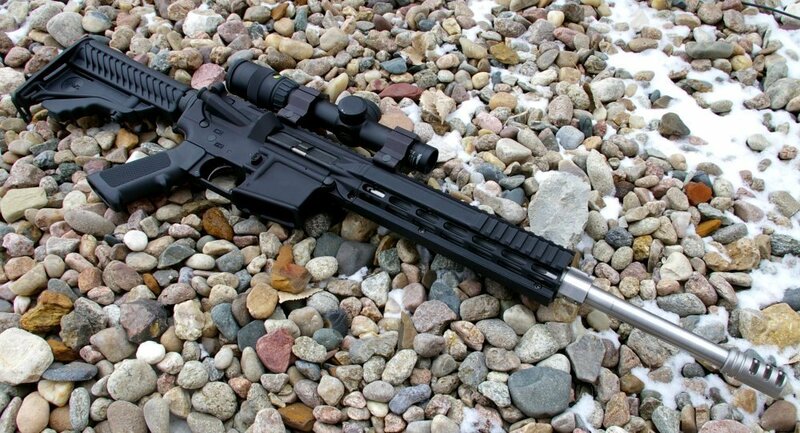 In the planning of my Aero Precision COP monolithic upper SDM (Squad Designed Marksman) build, accuracy was paramount. After speaking with John Holliger at White Oak Armament (who manufacturers barrels for President’s Cup competitors), he recommended I use one of his 16” heavy fluted Mid-Length SDM barrels coupled with his stainless low profile gas blocks and gas tubes which have been very popular with his law enforcement and military customers. White Oak is known for delivering top quality and the match grade barrel I received was an outstanding work of art with a flawless finish and fluting. As the pictures show, the White Oak Armament SDM barrel is a stunning looking barrel which is unfortunate, because most forends will cover up the beautiful flutes under the handguard. The barrel provides the feel and stability of a bull barrel without the weight. The fluted bull profile stepping to a heavy M4 barrel profile after the gas block contributes to a weight reduction down to a manageable 2.5lbs. White Oak Armament offer the buyers various barrel blanks options including the renowned Shilen button rifled blanks I chose which are famous for delivering consistent accuracy. Shilen button rifles their barrels to buyer specifications of diameter and twist and and then air gauges them for consistency. In the case of my barrel, White Oak ordered a Shilen blank to my specifications and then completed the profiling, fluting, chambering, threading, and final finishing. It is this final attention to detail by White Oak which maximizes wrings every little bit of accuracy from the best blanks offered in the industry and is the reason White Oak barrel are in the winner circle over and over again for those matches focused on tiny little groups. My 1:8 twist barrel was made from a Shilen button rifled blank and finished with White Oak’s own .223 Wylde style chamber which provides reliability and accuracy with both .223 and 5.56 NATO rounds. The “stock” White Oak 16” SDM barrel is spec’e with a 1:7 twist, but I like the more consistantly accuracte 1:8 twist which from my experience holds more consistant groups between various bullet weights. If I find a great deal on some 55 Gr rounds I know the barrel will still shoot them well which is not always the case with 1:7 twists paired with 55 grain rounds. John Holliger noted the best situation for accuracy would be to upgrade to a longer bull 20” barrel, however the 16” SDM version was designed to provide more maneuverability and less weight (2.5lbs) with minimal loss of accuracy compared to their 20” models. To get the weight down of this otherwise heavy barrel, twelve aggressive deep flutes are cut from the chamber to the gas block which shed weight and also aid in cooling during sustained fire. 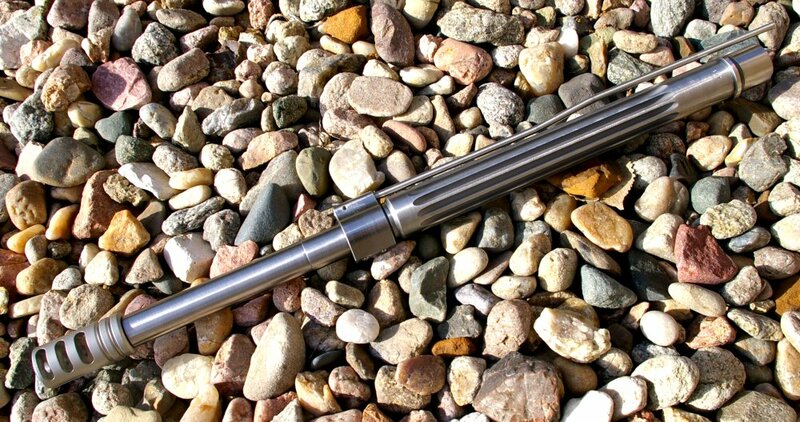 To finish off the internals of the build, a standard phosphated AR Bolt Carrier Group was used, with a Gas Buster charging handle with Tactical Latch and Quite Brake from PRI. My Geissele trigger SSA-E equipped Aero Precision lower, previously used for my JP Enterprises Barrel kit build, was used for the build. I wanted a solid dependable day/night optic able to transition from tactical/defensive distances all way out to 500 yards, so I choose to move my reliable Trijicon AccuPoint 1-4X24 scope over to this build with Tactical Millet Rings. 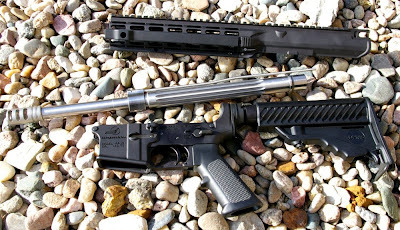 Functionally the White Oak Armament barrel ran completely flawlessly with all manner of 5.56 and .223 rounds and delivered great groups rightg from the first magazine. Shilen and other blanks used by White Oak are all all hand lapped, a process which removes imperfections from the rifles and throat. The reason we “break in a barrel” is to remove those imperfections and smooth out the barrel, so the recommended limited break in requirements from Shilen and White Oak make sense. For barrel break in Shilen recommends only to clean after each shot for the first 5 shots and then clean every 5 shots for the next 50 shots. White Oak’s opinion is that around 25 rounds should be shot and then the rifle thoroughly cleaned. I followed Shilen’s break in advice which allowed about the right amount of rounds to get my Trijicon re-zero’ed. There is a reason so many have deep respect for John Holliger and White Oak Precision and White Oak Armament. The White Oak SDM barrel delivered .65” groups with the 1-4X scope at 100 yards testing out some /new Hornady 5.56 NATO 55Gr GMX rounds. Bolting on my Simmons Predator Quest 6-24 Scope showed the true accuracy of this barrel when paired with Hornady 5.56 NATO 75 GR BTHP SPF with several .4” 100 yard benchrest fired groups. On the 200 yard line, I managed a 4-shot 1" group with one called fifth flyer. I was trilled with this, but a little more time behind the gun I could see delivering these types of 200 yard groups on a regular bases. At this point I am still getting comfortable with the barrel, however my hope is to start working this barrel out to the 600 yard mark over the next couple months. I definitely own a couple tack driving rifles, however what struck me most about the White Oak SDM barrel was the consistency of the group to group sizes starting right from bullet #1 through the barrel. Sure the barrel is delivering better and better groups as I approach the 500 round mark, but the break in curve and accuracy improvement has not been as dramatic as with other non-hand lapped barrels. Although I may not have the ability to deliver 2-3” iron sighted 100 yard groups, I can see the SDM's dependable consistency would be of paramount importance to those National Match type competitors. For a SWAT team sniper or special operations SDM type role, this barrel offers exceptional accuracy which in theory could deliver 4" groups at 500-600 yards in the right hands and right optic in a light compact barrel format. The next couple months of range time will be telling and I learn the real limits and performance of the barrel. Remounting the Trijicon 1-4X AccuPoint and loading more of those Hornady 75 GR rounds netted an .56” group which I could not be happier with on a 1-4X scoped rifle. This accuracy will definitely fit the bill as an SDM rifle and back fill as a paper puncher for distance work as well as an outstanding varmint hunter. All around this barrel delivered on accuracy and paired with the complete configurable Aero Precision Monolithic Upper provides extreme versatility from just one rifle. You can order a barrel, but there are few barrel manufacturers who will allow complete customization and White Oak is one of them. They certainly have a huge selection of “stock” models, however if you want something special as I did, ll you have to do is ask. Because I requested a 1:8 twist versus White Oaks standard 1:7 on their 16” SDM the wait was longer. In my case it took around eight weeks for the order. The voice in your head keeps telling you, “well it is a custom barrel”, but the impatient part of your brain starts to wonder if you did the right thing. Rest assured any wait is well worth it as the accuracy, fit and finish is absolutely sublime. At $370 this is not a beginners barrel and in fact I would suggest you hold off on a barrel of this caliber until you are shooting consistently out on the 100 yards range. If you are a tactical high rate shooter on the 25-50 yard line this barrel also makes little sense, however for those that like to reach out well beyond 100 yards on a regular bases with precision the White Oak SDM barrel could literally be a life saver. Tactical teams will appreciate the SDM's very consistent accuracy where someones life could depend on the difference between you shooting a 1.5” group or .5” group. I tip my hat, pass on an approving nod, and an enthusiastic thumbs up to White Oak Precision, White Oak Armament, and John Holliger. Bolting a White Oak barrels on to my SDM build certainly makes me understand the well earned respect they have earned and will a little more experience with various rounds, this could in fact be the most consistently accurate 16” AR barrel I have yet to test. 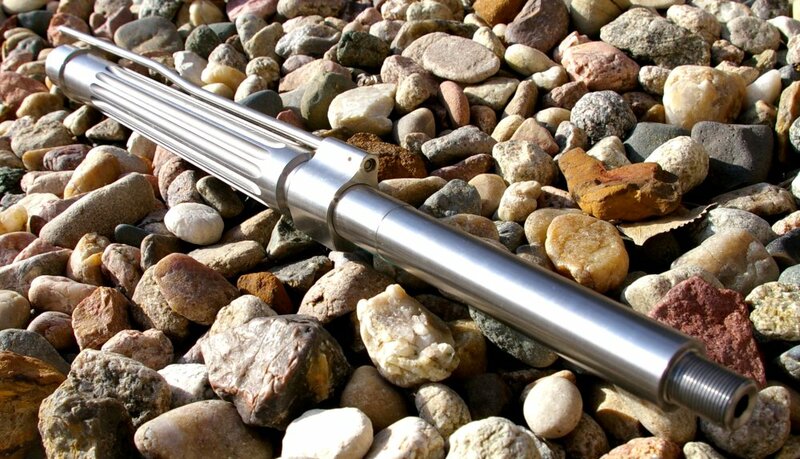 Inspired by the Army's Squad Designated Marksman rifle, this is a shortened 16-inch version of the .223 SDM barrel. 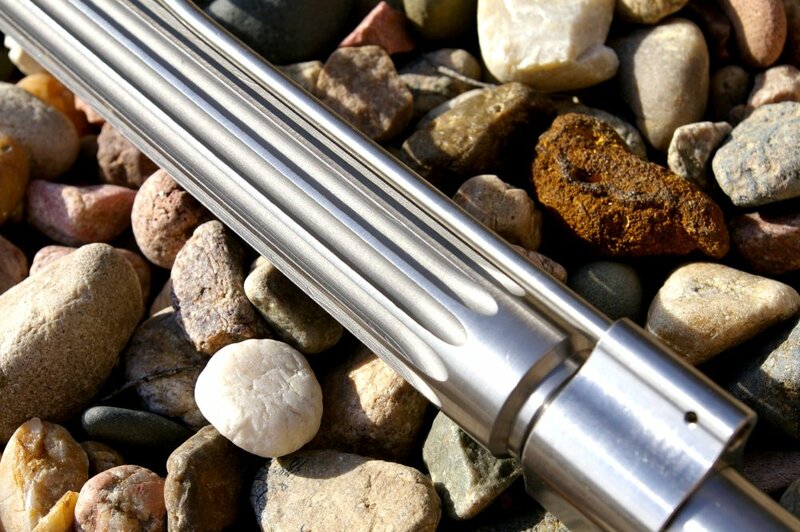 It is a light weight stainless steel barrel featuring 12 large flutes to reduce weight and aid in cooling. Length (select only one) 16"